Having Problems with Probation or Parole in Texas? Parolees have a constitutional right to due process if the X condition is being imposed on them as a condition of parole. This process is called a Coleman hearing. If this is the case for your loved one, they have the right to a hearing and to legal representation. Call The Marshall Law Firm: 817-435-4795. Talk to Texas parole and probation attorney Trent Marshall. Are you worried that the drug or alcohol addiction that got your loved one in trouble in the first place will make it hard for him or her to follow through on the conditions of their probation or parole? You can retain The Marshall Law Firm before any problems occur. Then, if something does go wrong, you’ll have a criminal defense attorney who knows your case ready to step in to try to minimize the damage. Did the Probation or Parole Officer Overstep the Bounds? There are hundreds of internal policies instructing probation and parole officers on what they can and can’t do, but P.O.s don’t always follow the rules. Sometimes that can work in a person’s favor but usually not. Get assigned to an overly diligent parole officer who oversteps his authority and it may mean a trip back to jail or prison. A lawyer may be able to run interference, changing the dynamic of the situation. Mr. Marshall can talk to the probation officer and explain steps the offender and family are taking to address the problem – such a counseling or treatment. He may talk to the D.A.s office as well, to see if there’s another way to handle the probation violation other probation revocation. 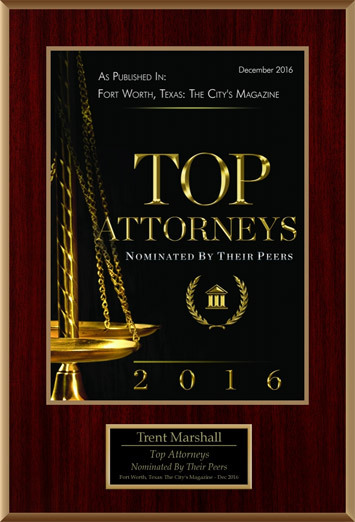 Contact Trent Marshall for legal help before a crisis begins. Call 817-435-4795 for a free consultation. Traductor de habla española disponibles.